The Battle for Tomorrow: A Fable by Dr. Stuart Jeanne Bramhall. Review: A book with so many life lessons and about this girl who is stuck in a rut is a good read for many ages is called The Battle for Tomorrow by Dr. Stuart Jeanne Bramhall, an author originally from the U.S. who moved to New Zealand. This book is about many good and just regular acts made by Angela Jones; a thirteen-years-old who had undergone her first abortion and soon decides to go Goth as well. Although this book isn't part of a series, it is phenomenal and I will reread it many times to come. The Battle for Tomorrow is much more than a fable; it is also heart warming, tear-jerking, and suprising to many who will it, and its message rings true to all. The story takes place close to Washington D.C., as well as many other places like Africa for one chapter. Angela must help take care of her mother because her mother, Diane, is paralyzed on her whole right side and cannot speak as the result of a recent stroke just after Angela's 13th birthday. Due to the recent abortion, Ange takes a counseling class plus a pregnancy test weekly. Soon she starts to date a twenty-three-year-old political activist who soon opens up her eyes to see the importance of the urgent political and environmental issues facing humanity all around her; a bankrupt global economy, catastrophic climate change, and looming water, energy and food shortages. These crises are all around her, happening all throughout the book, all leading to alarming consequences for her new life as an adult. I think many other people should read this book, especially readers age 13 and older, because it is filled with many life lessons throughout the plot of the story. It shares issues that are not only close to home, but also following what happens all over the world today. Sometimes teenagers don't listen, but maybe after reading this book, they will. The Battle for Tomorrow also explains many other things that can be good, bad, fun, or cool to do depending on the reader's interest. But the major reason this book should be recommended to people all over is because overall, this book is absolutely phenomenal. Since The Battle for Tomorrow is outstanding, I recommend it to all of you who are bored on vacations and days off. Read this book, and trust me; --- it will be outstanding and flabbergasting in many ways. The Battle for Tomorrow received the Pinnacle Book Achievement Award which is given out to very few gifted authors. Dr. Stuart Jeanne Bramhall earned his award in the category of Juvenile Fiction. Bramhall has not always been an author: he is a retired psychiatrist who is using his exceptional writing skills to bring a very important message to young adult readers. I give this book a rating of 5 out of 5 stars because of depth of the storytelling and exceptional voice used throughout the book. Review written by Sam P (6th grade student). We would like to thank Stuart Bramhall for providing a copy of The Battle for Tomorrow: A Fable for this review. 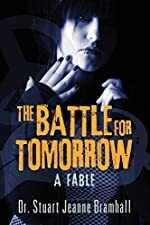 Have you read The Battle for Tomorrow: A Fable? How would you rate it?